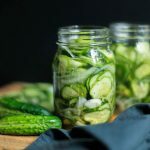 This recipe for small batch, quick refrigerator pickles is straight from my great-grandma, with no need for kettle steamers or vacuum-tight lids or canning. You can enjoy them on burgers or sandwiches of course, but I usually snack on them as a tangy sweet treat all by themselves. I’m slowly but surely learning the wise ways of my relatives when it comes to preserving the excellent fresh produce that summer has to offer. Last year my main summer priority was learning how to preserve sweet corn to enjoy all year. This year I decided to tackle refrigerator pickles, which as it turned out wasn’t all that hard. I thought there would be a some kind of huge complicated process, but once I tried it, I wished I had tried sooner! 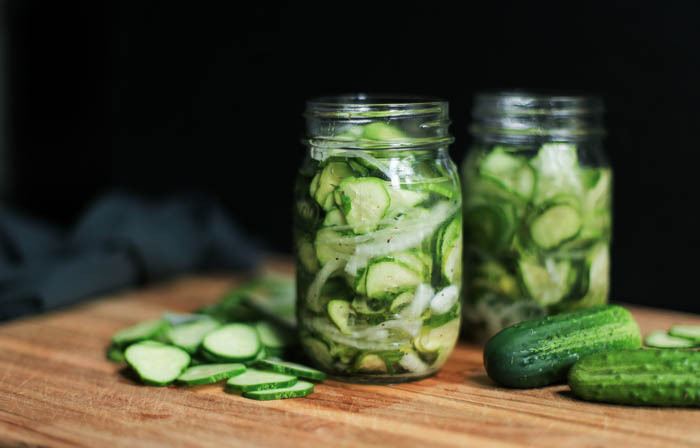 I grew up eating my grandma’s dill pickles, which require canning equipment, heating a brine, the entire works. I still enjoy eating those (and tend to make jars disappear every time I go home) but I don’t have the equipment to make them myself. So I turned to the sweet refrigerator pickles, which require two steps to make an excellent pickled cuke. Basically, lazy gal pickles. These taste sweet rather than very sour (and not at all like dill pickles) – perhaps the significant amount of sugar has something to do with that, shhh don’t tell. As soon as the small pickling cucumbers popped up at the farmers market, I brought home a bag. 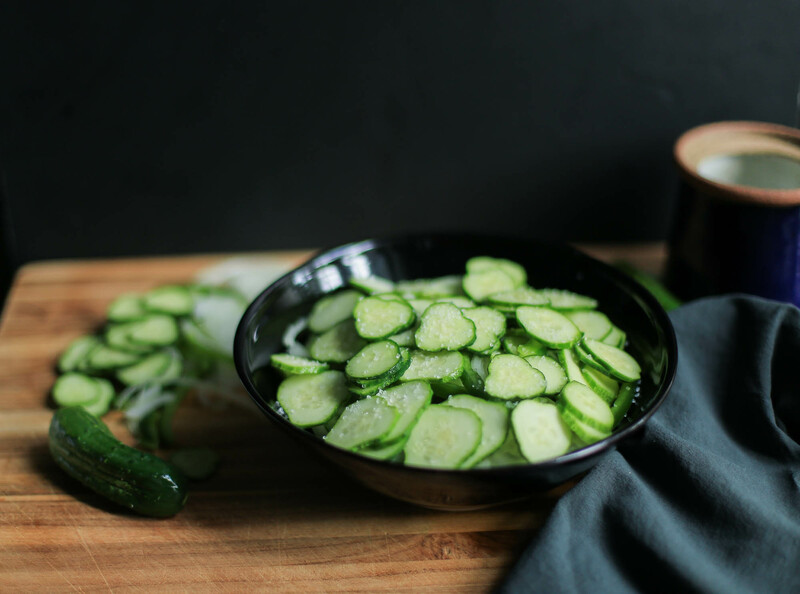 The type of cucumber you need for this recipe is the Kirby cucumbers, which are the small odd-shaped ones covered with little bumps. 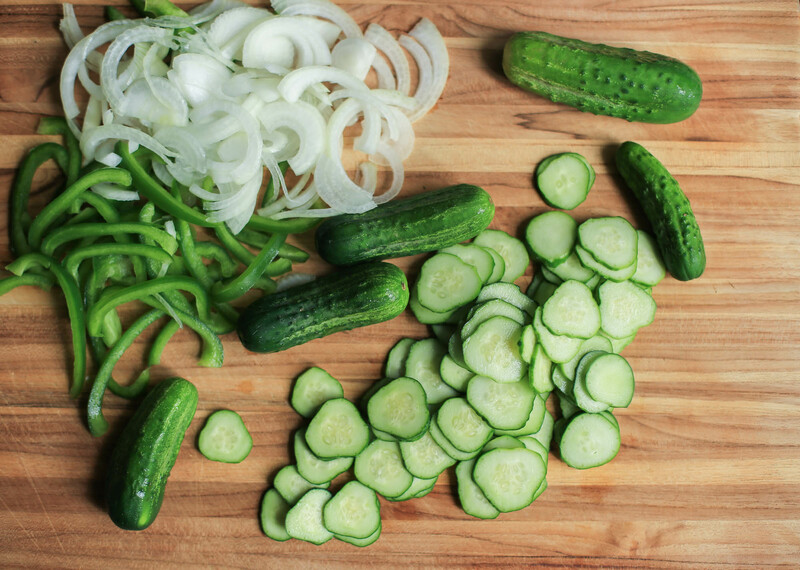 To start, slice those cucumbers up – I use my mandolin to make quick work of it – and then let them soak in salt for 2-3 hours. That’s right, just walk away. Add sliced green pepper and onion for more flavor. Once the cucumbers/peppers/onions have sat there for a few hours, drain off the extra liquid and then proceed with step two of two: mix some vinegar, sugar, and celery seeds together. 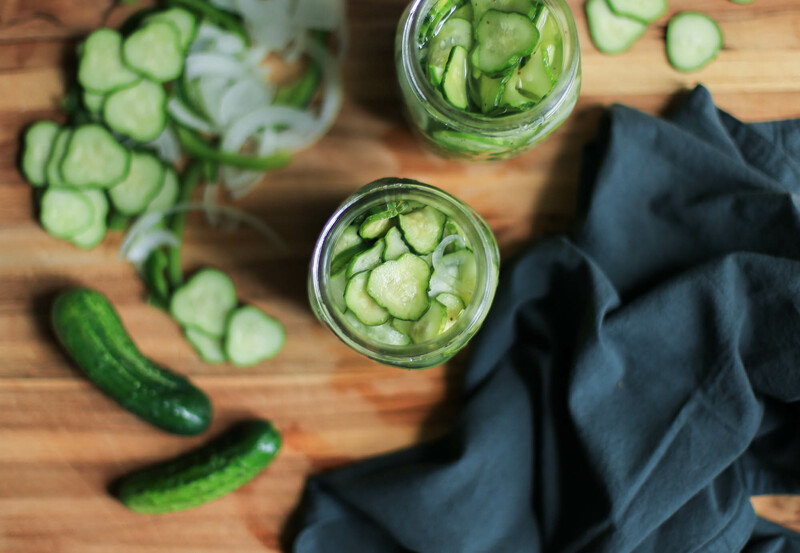 Combine with the pickles, put in a glass container with a lid, and refrigerate. THAT’S IT GUYS. So if you can chop a couple veggies, and stir a few things together, you too can make pickles! I use mason jars with these lids for storage. 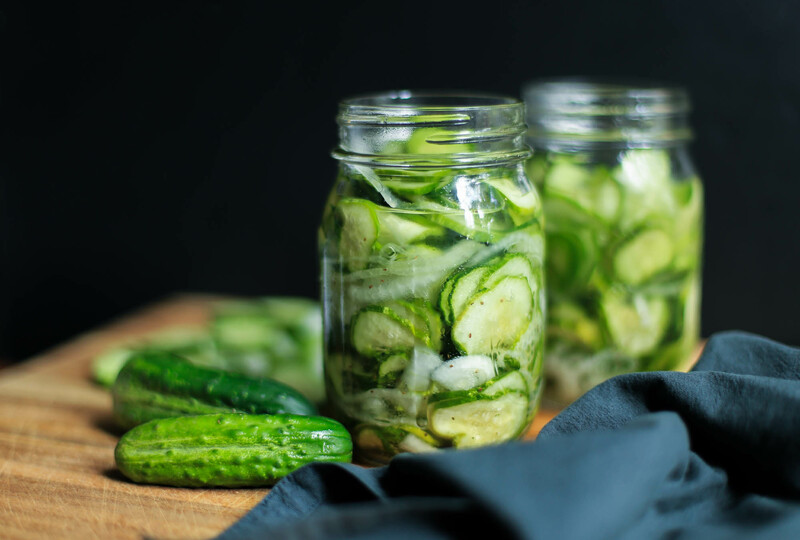 The hardest part about making these pickles? Waiting 1-2 days for them to achieve best flavor in the refrigerator. Taunting you. I guess that’s when you learn patience. Oh, to be an adult. Thinly slice the cucumbers (use a mandolin if you have it) and place in a large bowl. Add the onion and pepper. Sprinkle with the salt, and then mix to coat. Let stand for 2-3 hours. Drain off all liquid. In a small bowl, mix together the sugar, vinegar, and celery seeds. Stir the sugar mixture into the bowl with the cucumbers and onions. Transfer the vegetables and liquid evenly into glass jars, seal each with a lid, and refrigerate. Wait 2-3 days before eating for best flavor. The pickles can be stored up to a month.